We are proud to offer such a historic plane as our first 12 blade 80mm EDF offering. The A6 Intruder is easily one of the most requested models, so we wanted to offer an EDF jet that would stand apart from its competitors. 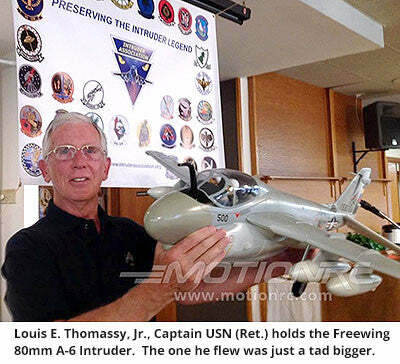 As you've come to expect from Freewing Model, the A6 intruder is loaded with scale features and performance componentry. The new 80mm 12-blade EDF with metal housing powered by a powerful 1750kV motor produces nearly 6 pounds of thrust for awesome speed and incredible maneuverability. The sound produced from the 12 blade EDF will simply blow you away. 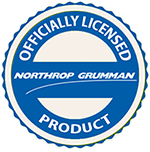 Model officially licensed by Northrop Grumman. I am disappointed that the fit and finish was not better. The rear fuselage did not fit with out gaps on one side of the joint. The danger decal's on the intakes were upside down. I really think this Jet needs lights installed from the factory. Need to include the weapons set with the kit. It is currently unavailable. Metal retracts instead of the plastic base retracts concern Me for durability on rough or grass runways. I have not yet flown this jet due to winter weather here in Michigan. excellent service, the best in the industry. The plane looks nice and has been fun to fly, but during setup I noticed that the metal pin that you attach the horizontal stabilizers to was backwards. I needed to unscrew the control connections and switch it around myself. I then noticed that one of the securing screws wouldn't tighten. The plastic had been hollowed out from when the factory guy installed the screw (he over-tightened it, stripping out the plastic). I also adjusted the control horn hole position to the second closest hole to the center to reduce the elevator throws. The stock position was giving me almost 4 times the amount of throw as needed! I'm not sure if this was just my model, or if it's how these are all setup from the factory, but BE CAREFUL about this. Very Nice Model. Freewing does a great job. Already have my next one picked out. Easy to assemble, flies great and looks fantastic. My first EDF, and I was impressed. Flew like a pattern trainer. Lost the airplane though, because I did two things wrong... the remote receiver antenna was oriented the same way as the receiver antenna, and I trusted the BEC to provide power throughout the flight... voltage dropped to the point where the receiver 'browned out' and I lost control. Replacement A6 has been received, upgrading to the DX8 and AR8010T receiver to monitor receiver battery voltage. I'm also installing a separate flight pack battery just for the receiver.